I had nothing to do this past weekend. without the sound and had Twitter on to keep me company. One tweet caught my attention, I sent a reply never expecting a response in return. However TAKUYA did respond and suddenly my Sunday was going in a completely unexpected direction. I managed to make our interview appointment with two minutes to spare, after a late night a flurry of activity to prepare, an early morning bus ride and Sunday travel to Brooklyn without the L train. We met outside his friend’s place in Williamsburg, up until he and our translator Erika appeared I had expected someone to come outside the building and tell me to move along. We exchanged handshakes and bows. Then walked a couple of blocks over to a hipster coffee house, I had the chocolate milk, we all sat down outside under an awning while a light rain came down and we talked about music, New York, his creative process, the past and the future. Along with our translator we shared a good conversation, a few laughs and I then thanked him personally for making music that helped through a rough patch in my life, he said that he was glad that it had helped. He is a modest man without the trappings or attitude that one would associate with an international rockstar. TAKUYA was born in Kyoto, Japan, he joined JUDY AND MARY (JAM) in 1992 as their second guitarist, but soon began taking on songwriting for and producing the band, helping to take them to new heights in the pop music world. When JAM dissolved in 2001, TAKUYA continued making music with his other band ROBO+S, later with TAKUYA and the Cloud Collectors and under his own name as well. Today he is sought after worldwide as a guitarist, onstage performer, music producer and audio engineer. He was kind enough to spend some time answering questions in person on an unseasonably chilly Sunday in May. RiceburnerFM: What brings you to the states? Why Williamsburg in particular? TAKUYA: Since last Christmas to this past April I have been very busy, my artist friend invited me to a show that she is having a show in Tribeca and New York City sounds good. I have been traveling to many cities, NYC sounds the best, maybe its the high ceilings, I am always knocking on walls, checking the sounds. This town is special. RiceburnerFM: Williamsburg, Brooklyn is known for its large hipster population and hipsters love vinyl, as both a musician and a music fan what are your thoughts on the resurgence of the vinyl format in this digital age? TAKUYA: It is good to have choices. Last year I talked to a master cutting engineer who said that the first CDs that went out did not have good sound quality, young people never got to know the (vinyl) format. In my opinion (on digital) it is fine, as long as the hard drive gets bigger, has higher resolution and can store more information. That is something people are trying to get with analogue. what is the one song you need on a road trip or in your case as professional musician … on tour? 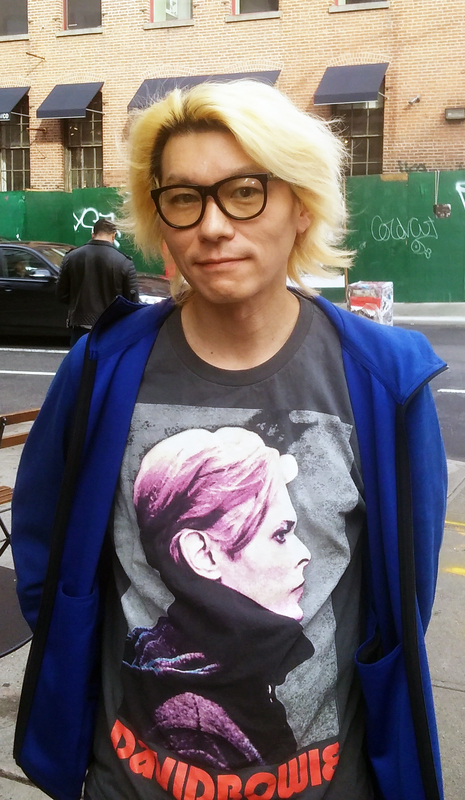 TAKUYA: U2’s Beautiful Day, once you are out of Manhattan, traveling the area on Amtrak. I remember listening to it after 9/11. It is a strong memory. RiceburnerFM: There is an old saying, that to be really successful at something, you have to really want it, so what made you really want to be a musician? TAKUYA: When I was young I loved sports, but I got into a fight with other kids and actually broke my skull, so no more sports. When I was older and was away at school, I borrowed keyboards from school and thought about getting one of my own. I called home to ask my parents, but the phone was busy all day. The next day I found out that our house had burned down. After that I could not ask my parents for keyboards, but my friend offered to sell me one of his guitars for cheap. Two days after I first touched a guitar I knew that I would be musician, that I would never get bored of playing the guitar. RiceburnerFM: Walk us through your creative process, how does TAKUYA craft a song? TAKUYA: In the past I would think that I can create or I can’t create. I don’t have time for that now. I am a professional, so I will make a song. Humming, strumming my guitar, the entrance is open. I start in any direction, it is not a linear process. It is like running from the park, which street is more fun to take, it is like that. Or if the goal is the park, how do I get there? Uber, biker ride, walk? Yesterday I went to the park, it was raining, I felt like running was the right way to go. Physical exercise is also important as I may get a call for work or be asked by a friend to perform and I have to be ready. RiceburnerFM: Describe the TAKUYA signature sound in one word. RiceburnerFM: What is the make and model of your favorite guitar and does it have its own name? TAKUYA: 1950 Fender Broadcaster that I got from Nashville. No name, I am not good with names, song titles are hard to pick. RiceburnerFM: Judy and Mary continue to win new fans worldwide via YouTube videos. Your instructional guitar app “Guitar de POP” features several JAM hits. How did the app project come together and what was it like to revisit some of your earlier work so many years later? TAKUYA: It did not feel like it (the music) was in the past. As for the App, CDs are not selling very well also I am always trying to find new formats for my music. RiceburnerFM: The recent Hollywood adaption of the classic anime / manga Ghost in the Shell highlighted the American entertainment industry’s struggle with the issues of whitewashing, diversity and cultural appropriation any thoughts these subjects? TAKUYA: We are all living on a small island. It is coming together, Chinese companies investing in Hollywood, Asian actors as main characters in a Star Wars movie. I see cultural differences shift while producing music in Beijing and Taiwan. All Asian countries are very focused on music. I learn about different cultures at the same time (via the internet). I write songs with American artists and try to work all over the world, catch the trends in the world. I do not have a in-the-box mindset. It does not have to be my guitar or my song. As long as it is good music I am open to it. RiceburnerFM: You first went on stage in 1989, in an industry famous one hit wonders and short lived careers you have had a long successful enviable career in the music industry both as a performer and a producer, are you working on any new projects or songs currently? TAKUYA: I continue to be a song producer, a guitarist, my guarantee ($) is very high, so they don’t call me very often. Recently I started playing with an Idol Group Momoiro Clover Z, performing for the whole show. Interesting because outside of just a few songs, it has been a while since I played with young female vocals. After JAM, maybe I didn’t have a good time for a while, but I am feeling that I getting better, just now in the last couple of years. I have had my (recording) studio in Tokyo for fifteen years, my studio maybe too edgy for some. I have a hard time booking (space) in my own studio because it is very busy. I am ready. Prepared as a musician, songwriter, engineer, from every angle. I still have the dream of being a guitarist and being successful. RiceburnerFM would like to thank TAKUYA for taking some time on his Sunday to answer these questions and for making so many lives better with his music. Also thanks to Erika for translating for us. 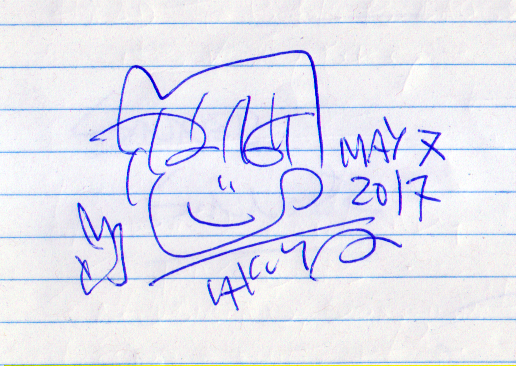 but TAKUYA did doodle this in my notepad. This entry was posted in Feature, Interviews and tagged #JAM, 2017, J-rock, jpop, legend. Bookmark the permalink.